SELECT ABOVE "Community Groups - FALL SEMESTER 2018" and explore the groups we are offering this semester. 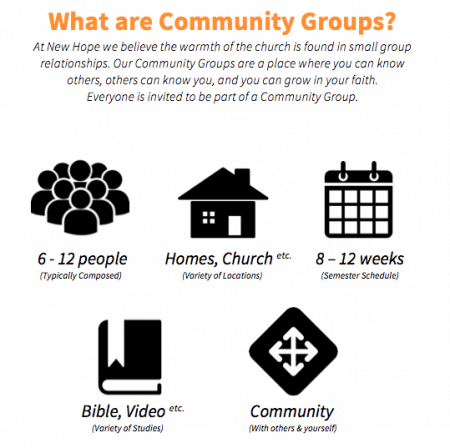 PRAYERFULLY take some time to consider which Community Group you would like to join. SIGN-UP for the Community Group you'd like to join on Sunday, Sept. 32 @ New Hope (lobby or website)! SHOW UP & INTERACT with others for a great semester of learning, growing and connecting!